Summer exits officially this afternoon at 4:02 PM EDT. Summer has been checking out for quite while now given the cool temperatures and rainy skies. The trees are even beginning show some color here. I believe that I am as ready as I can be--the pool is closed and I have made preparations for cutting the grasses around the pool on Columbus Day. All of the Autumn related activities are gearing up. 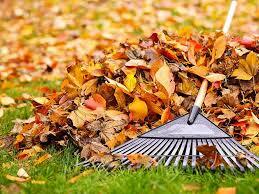 There is even a big pile of leaves in my yard that need to be removed today. CNN published some 5 facts about autumn. Autumn facts. I found Fact 4 to be especially interesting as I had never read about how the season that we are entering came to be called autumn, or harvest, or fall. Whatever the season is called, the real situation is that now the Sun, my favorite bright orb in the sky, will be focusing its light on the Southern Hemisphere and leaving those of us north of the equator in more darkness than light. The year 2017 is rocketing by. There are just over three months remaining in the year. The final full season of the year is beginning and the trees will soon be bare once again. The slide into winter has begun, but at least summer's last gasp will be keeping our temperatures in the 80's.